We often adopt and adapt huge beauty trends from the Asian market, identifying the wondrous formulas and innovations they develop and bringing them to the UK. We’ve had BB and CC creams, spray foundations and manga mascaras, but now it’s the turn of ‘cushion’ foundations that turn everything you know about bases on it’s head. This revolutionary new application method isn’t just about re-purposing what was already working perfectly well, but ensuring a flawless and super lightweight application; the result leaves skin practically glowing and can cover the entire face in seconds. These compact-like bases are applied using a foam pad, with the cushion within the compact holding the formula and releasing it when it’s pressed down; it may seem like added faff, but it actually makes applying foundation an absolute doddle. 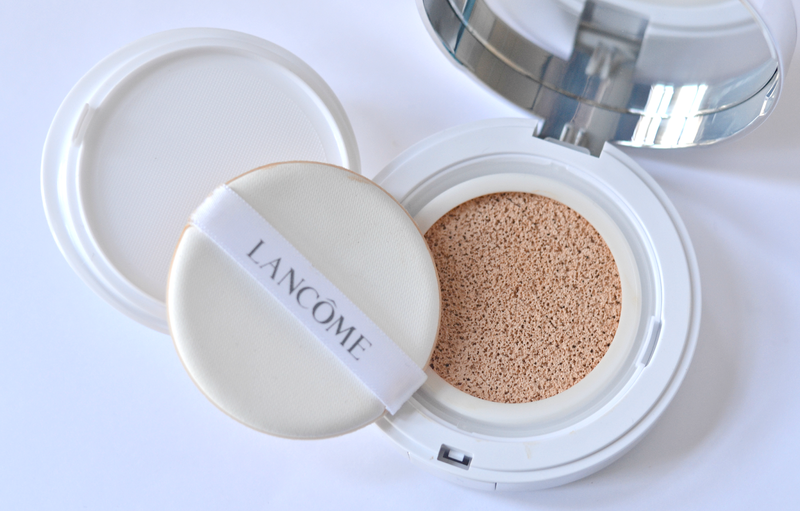 The new Lancome Miracle Cushion Foundation compact opens to reveal a super soft cushion that’s full of tiny air holes, saturated in the lightweight foundation formula. It’s been designed to provide an even amount of product and always saturate the cushion to ensure it’s easy to apply; the foam applicator has also been designed to ensure even and comfortable coverage, without soaking up all the product or getting in a mess. As someone that hates using foam applicators I expected to hate this, but the pad is extremely soft and picks up enough product to ensure an even finish. You simply wipe the saturated pad across your face to distribute the foundation, pressing it against the cushion to release more product as you go. Although I’m usually a fan of much thicker formulas that I can really put to work, this is a lighter alternative that provides a natural dewy glow. In a similar fashion to a BB or CC cream, the texture helps to even out imperfections and reflect the light for a naturally radiant complexion; it even contains colour correcting technology to minimise redness or discoloration. If you’re not a fan of heavy foundations or hate covering the contours of your face, this could be a great alternative. As the first ‘cushion foundation’ to launch in the UK, I’ve no doubt this will be everywhere in the coming months and inevitably spawn a range of copycats. I love to see the boundaries being pushed and for new ideas to provide us with the ease of use we demand; this is a great first step into real innovation in the foundation market that we’ve been crying out for. I would love to see other brands offering varying textures and coverage results, so that all needs are covered and all demands met, but this is a great first dip in the cushion foundation pool and one I’m definitely excited about. The Lancome Miracle Cushion Foundation launches in the UK on 11th February, priced £29.50 and available in six shades. The refills are available for £19.50. I don't think Lisa Eldridge has had anything to do with this – it takes in the region of 12-18mths to develop and launch a product; she's only been an ambassador for a number of weeks. This sounds intriguing! If I can find a good match, I'll definitely try it.